Situated in the southern Caribbean and offering great year-round weather, activities, culture, and a wide variety of accommodations and dining options, the Mexican Caribbean has something for every visitor. This area, referred to as the Yucatan Peninsula, borders the Caribbean Sea and that means lots of fun, sun in and on the water. The region generally includes greater Cancun (Mexico's largest tourist destination), the island of Cozumel (a diving and snorkeling hotspot), the Riviera Maya (spanning 80-plus miles of Mexican coastline south of Cancun), and the northern Yucatan coastline (with up-and-coming coastal destinations like Progresso and culturally rich inland cities like Merida). Quite simply, Cancun has something for everyone. With more than 29,000 hotel rooms ranging in price and style, more than 450 restaurants (many featuring great entertainment), nearby archeological sites, golf, watersports, shopping, spas, and more, Cancun continues to grow in popularity. The international airport is Mexico's second largest and serves as the Mexican Caribbean's main point of entry along with Cozumel. Cancun offers the unparalleled beauty of the Caribbean Sea's turquoise blue water and white sand beaches. Along the hotel strip, which spans more than nearly 19 miles, visitors will find everything from villas and five-star hotels to exclusive resorts and spas. There are several modern shopping malls, more than 500 restaurants offering the best in national and international cuisine, and numerous bars and nightlife entertainment. 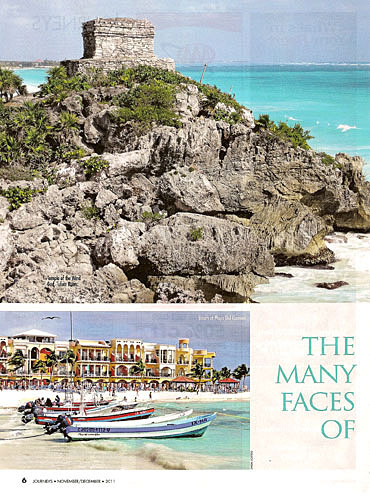 Also nearby is Tulum, a fascinating Mayan archaeological site. Tulum was one of the last cities inhabited and built by the Mayans, a culture that was at its height between the 13th century and 15th century and managed to survive about 70 years after the Spanish began occupying Mexico. Its ruins lie on a 40 foot cliff overlooking the ocean. Long-known as a diver's and snorkeler's paradise, Cozumel is a classic Mexican Caribbean destination. Mexico's largest island features white sand beaches, lagoons, mangroves, and world-class wall diving and snorkeling. Scuba diving and snorkeling remain one of Cozumel's primary attractions, mainly due to the healthy coral reef marine communities. These coral reefs are protected from the open ocean by the island's natural geography. The island's only town is San Miguel de Cozumel, which has a relaxed Caribbean atmosphere and Mexico's busiest international cruise ship dock. Located in a former hotel, the San Miquel's two-story Museo de la Isla de Cozumel is well worth a visit for tropical history buffs. 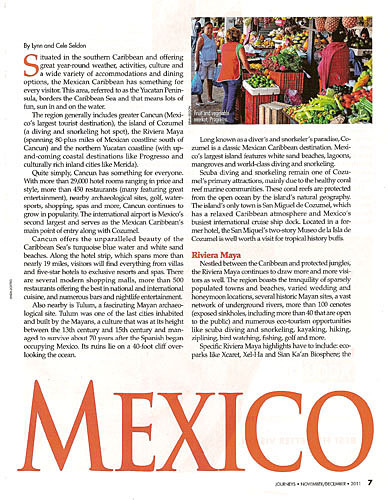 Nestled between the Caribbean and protected jungles, the Riviera Maya continues to draw more and more visitors as well. The region boasts the tranquility of sparsely populated towns and beaches, varied wedding and honeymoon locations, several historic Mayan sites, a vast network of underground rivers, more than 100 cenotes (exposed sinkholes, including more than 40 that are open to the public), and numerous eco-tourism opportunities like scuba diving and snorkeling, kayaking, hiking, ziplining, bird watching, fishing, golf, and more. Specific Riviera Maya highlights have to include: eco-parks like Xcaret, Xel-Ha, and Sian Ka'an Biosphere; the Great Maya Reef (and inland snorkeling and diving); special events like Xcaret's annual Life & Death Festival (always October 30th to November 2nd); spas using authentic Mayan treatments and rituals with local ingredients; Mayan archeological sites like famed Tulum, Chichen Itza, Chacchoben, and Coba; and the Rivera Maya's largest city, Playa del Carmen, which was once a thriving Mayan commercial center called Xaman Ha. A sleepy fishing village at one time, bustling Playa del Carmen now has a population of about 150,000 people and lots of lucky visitors. With great beaches, resorts, restaurants, shopping, and activities, Playa (beach in Spanish) features two-mile-long Avenida Quinta (Fifth Avenue)-a pedestrian only street lined with places to sleep, eat, shop, and more. The city's central location along the coast makes it an ideal best for excursions and adventures. The northern Yucatan coastline is also starting to gain attention. Situated about 200 miles from Cancun, historic Merida is well worth a visit, thanks to the opportunity to visit the many colonial buildings and impressive 16th-century structures like the city cathedral. Up on the coast, Progresso is one of several up-and-coming beach towns in the region. Now through 2012 and beyond, a major Mayan tourism campaign was announced by Mexico's president, Felipe Calderon. Called Mundo Maya 2012 and running through December 12, 2012, when the Mayan calendar officially ends, the Mexican government will promote a variety of events in southeastern Mexico's Mayan region, which is made up of the states of Campeche, Chiapas, Tabasco, Quintana Roo, and Yucatan. This region is home to six of Mexico's 27 UNESCO World Heritage sites, the most found in any one country. An aggressive infrastructure investment in roads and facilities is already improving access to the various archeological sites in the region. Two enhancement projects include the new Palace of Maya Civilization at Chichen Itza and the Museo del Mundo Maya in Merida. Similar projects are expected for Chiapas, Campeche, and Quintana Roo. The food found throughout the Mexican Caribbean is interesting-washed down with a cold Mexican cerveza, of course. Mid-March 2012 promises to be particularly tasty, thanks to the first Cancun-Riviera Maya Wine & Food Festival.